We asked Devin Redmond of Leafcutter Designs to give us a few tips on tackling text, no matter the size of your canvas! Read on for big time inspiration! It’s easy to think of creativity as an expansive free flowing exercise of raw imagination. It’s sometimes described as a spring inside you, from which ideas simply bubble forth and demand to be released into the world. Every once in a while, I’ll sit down to write a letter and the pen just seems to have a mind of its own. I already know what I want to say, and the right words keep stepping up at just the right moment. I love it when this happens! But more often than not, the blank page engages me in a quiet staring contest. Its pure white expanse simply affords too many options. In these moments, I benefit from the imposition of creative constraints. Sometimes its a writing prompt, like one from our Letters To My series, that gets me started. Other times, I’ll turn to our World’s Smallest Post Service Kit and pull out a sheet of tiny writing paper and the included .005 Micron pen. Knowing I have only limited space to craft an entire letter forces me to boil my message down to its stripped away core. Word choice becomes essential; introductions and explanations fatal. Say only what you mean, and nothing else! Ernest Hemingway intuitively knew about the focusing power of constraints when he famously challenged himself to write a novel in only six words. David Bowie knew this too, when he brought a set of Brian Eno’s Oblique Strategies into the recording studio. Take away the 140 character constraint, and Twitter is just another run-of-the-mill online publisher. Without limits and boundaries, even our most creative minds can easily get lost in the wilderness. While there will always be an essential role for long form writing, keeping it short is an art form all its own. It takes practice to master. To paraphrase Pascal's 360-year-old witticism (or more recently Mark Twain, according to urban legend), “I would have written you a shorter letter, but I didn’t have enough time." 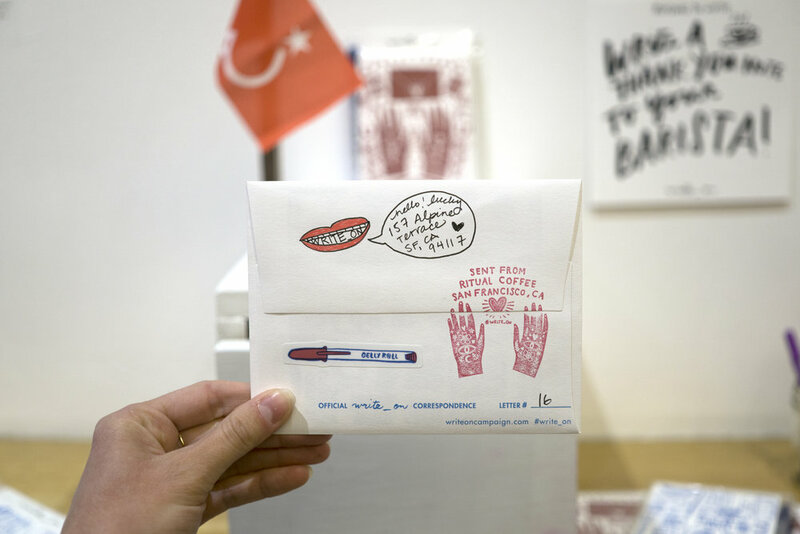 If you want to play with length as a creative constraint in your own letter writing, or just love the sight of these mini-missives and tiny packages, go for it! 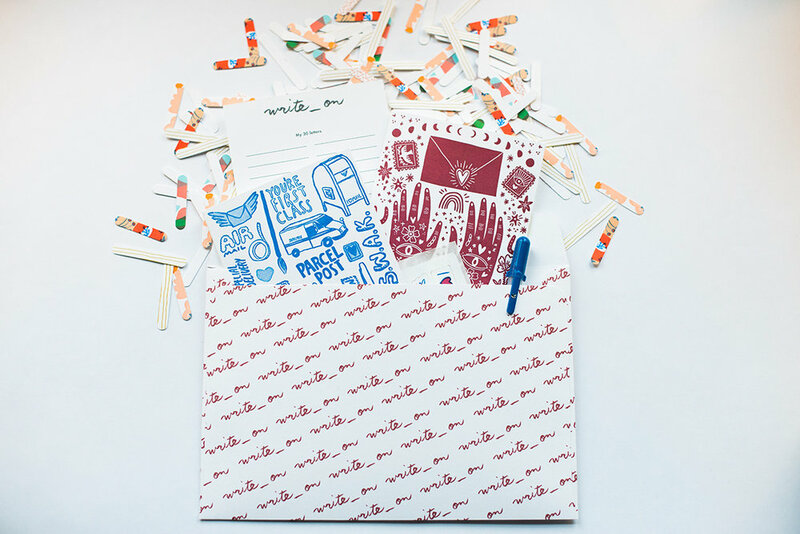 Here are three ways you can use the World’s Smallest Post Service Kit to spread joy and surprise to friends and family. Challenge yourself to write a six-word letter/poem to each of your closest friends. Six words only. No more, no less. See if they reply with brevity or long-windedness. This idea is inspired by Hemingway, SMITH Magazine’s Six-Word Memoirs project, and the emerging flash fiction genre. Plan a tiny-themed party and send everyone tiny invitations. Make miniature bags of popcorn and serve tea a sip at a time. We did this at the Leafcutter studio not too long ago! Resolve to give small gifts of wit and ingenuity, instead of material goods, for your friends’ birthdays this year. Find a small inexpensive object, like a square of chocolate or a toy compass. Think up a sweet or sassy message, like “There’s nothing semi about you and me,” or “Wherever you go, I’m sure to follow." Wrap it up in an exquisitely detailed tiny package! What are your favorite creative constraints when it comes to letter writing? We know that the act of writing letters helps us develop a better understanding of ourselves, which is a nice side effect of connecting with others. This year, we wanted to dig deeper still and see what we might learn by taking what is often considered a solitary act into a more public arena. Our launch events in Portland and San Francisco proved that there is indeed magic and power in the act of writing together. 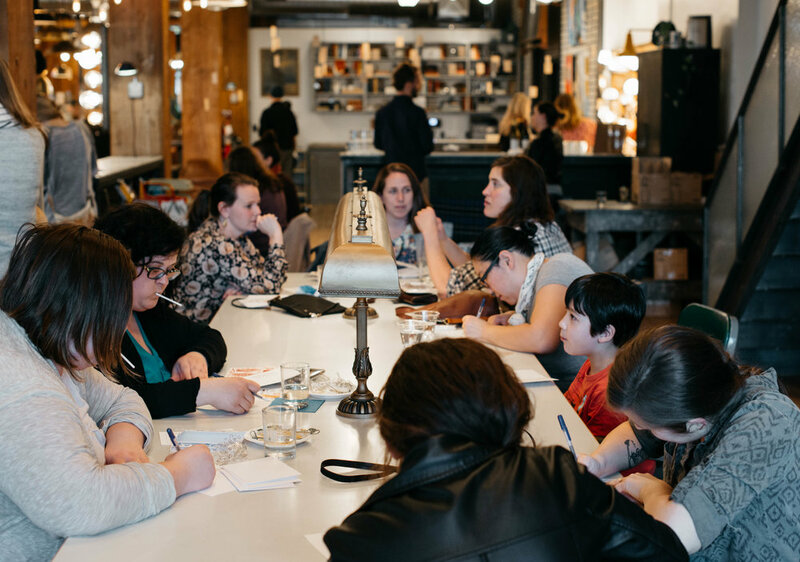 Portlanders kicked off the Write_On Challenge in partnership with Schoolhouse Electric once again this year in their beautiful showroom. The energy was nothing short of magnetic. 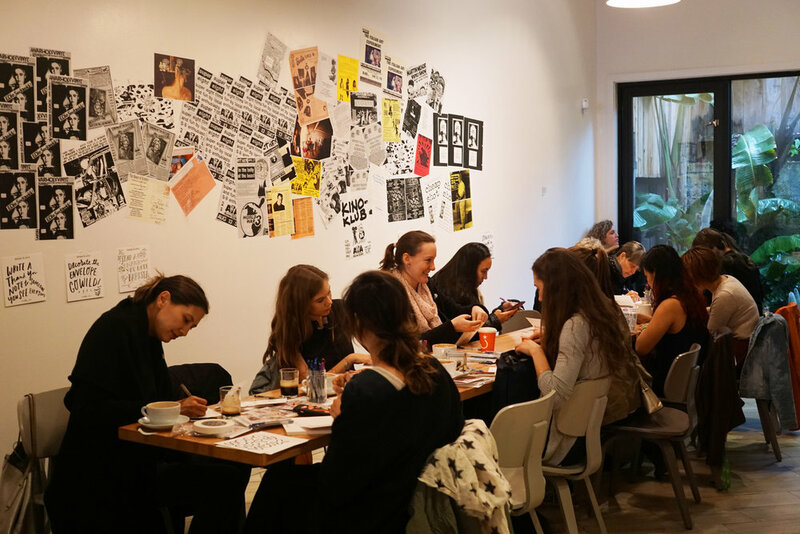 This sold-out event attracted letter-writing enthusiasts of all ages, who convened at the table, on the floor, and on couches — all in the name of letters! 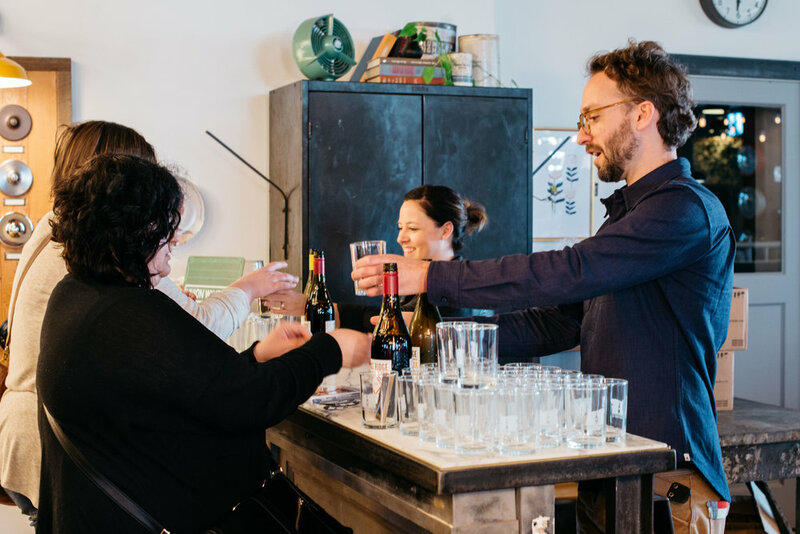 As guests gathered for a meaningful evening of putting pen to paper, they fortified themselves with wine from Union Wine Co., brews from Occidental Brewing, delicious bites by Artemis Foods and candy magic from Quin. In honor of all things analog, DJ Aquaman provided the perfect vinyl soundtrack to the evening. Guests were invited to participate in a new activity this year by writing a "Letter to their Future Self." Next year, Egg Press will mail back all of the author's letters to themselves. But for now, they are safe and sound in a letter time-capsule. Huge thanks to everyone who makes Write_On a smashing success year after year, and especially to Schoolhouse Electric for their generous spirit and inspiring space. We hope you enjoy the following moments as captured by resident Write_On photographer, Christa Fowles. What better way to hone in on a letter-writing practice than to make it part of your daily ritual. Hello!Lucky teamed up with Ritual Coffee, for a two-part letter-writing party that served as the official San Francisco Write_On kick-off. To really drive home the habit, we’re offering one card from our Write_On kit with every coffee purchase at Ritual Coffee on Haight St. and Valencia St. during the month of April. No excuses! We were so pleased with the response we received at the Haight Street and Valencia street events. We may be biased, but the coffee and card loving crowd might be our favorite! We gathered, we sipped, we wrote, and we did it all over again. 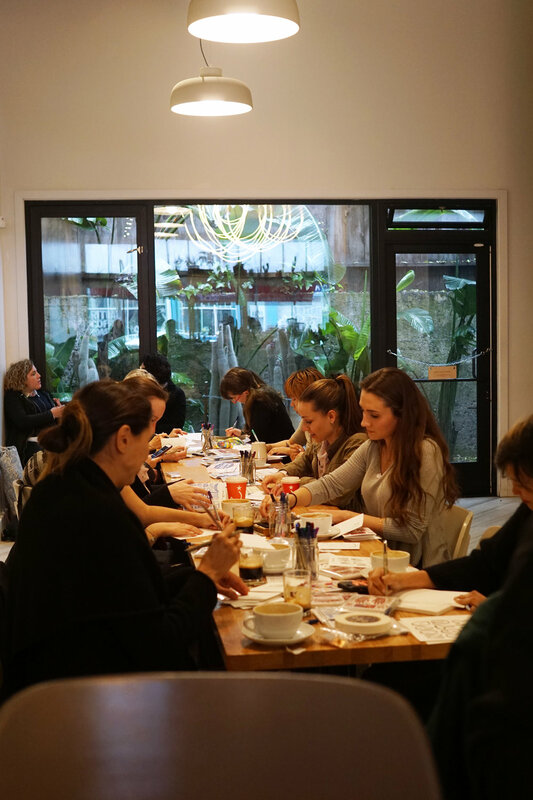 Special thanks to Ritual Coffee for co-hosting this Write_On event, to everyone who came out including the Sakura of America team, and to our sponsors for making Write_On possible. Although we've wrapped up our official Write_On launch parties, there’s still time to attend a community led Write_On event. Be sure to check out our Events Calendar for a look at what’s in store near you! I recently caught up with a good friend of mine, Katherine, in our favorite meeting spot, her kitchen. She dished up two bowls of braised kohlrabi that she'd just pulled off the stove. She is the founder of Cook With What You Have, a resource for delicious, simple, vegetable-rich meals, so it was not at all odd to find myself enjoying a savory bowl of winter produce at 10am instead of a plate of pastries, with her. Between bites, we got up to speed on the comings and goings of our lives. For years, we'd worked together on initiatives to help people understand where their food comes from and to develop an appreciation for the people who grow it and prepare it. So it was no surprise that much of our conversation on this morning was around food, but I also told her about the work I am now doing to encourage people to connect with one another via letters. This prompted her to pull a small blue envelope from a stack of papers on her kitchen counter. As someone who has spent a good wedge of time pouring over James Beard cookbooks, locating the street on which he grew up in Portland, and driving to the Oregon Coast to commune with a stretch of beach where his family held sandy cookouts every summer, this letter granted a kind of kinship with James Beard that I previously thought impossible. I moved through time and space; the blue ink on manuscript paper transporting me to the New York apartment of a hero. There with Jim, I sipped a rum cocktail, plucked a pickled walnut from a delicate dish and enjoyed the warmth of a hot biscuit . That morning, a special connection was forged that defied life and death and time and space, as letters tend to do. And, if you are in Portland, Oregon, we encourage you to visit our two Write_On restaurant partners who also believe in the power that stories and food have to connect us. Pine State Biscuits and Ned Ludd are offering complimentary Write_On cards to all diners this month. Belly up to the table, enjoy a wholesome meal and make a memory with someone. Both restaurants are offering writing prompts, that, you guessed it, are all about the nourishing potential of stories. Today on the blog, we caught up with Jillian Schiavi who presents us with tips on envelope dressing. Read on to hear from Jillian directly and see some of her work. Then, ready your pen; she makes it look so easy, we know you'll be inspired to bring your envelopes to life with beautiful strokes on paper! When was the last time you got something in the mail that made you smile? I’m talking pure ear-to-ear grin as soon as you opened your mailbox and saw what was inside. For most of us, the only non-cringe-worthy pieces of mail we get these days are packages we’re expecting from late-night online shopping binges. And while getting a box of clothes to try on at home is nice, there’s really nothing quite like seeing your name handwritten on the front of envelope, evidence that someone thought specifically of you. I’ve addressed countless envelopes as a professional (and slightly obsessive) calligrapher. For friends and family, for clients, political correspondence and for fun, I’ve experimented with different ideas of how to dress up these blank canvases. And what I’ve found is that while truly anything works, my favorites are simple. Black ink, white envelope, beautiful lettering. In honor of the Write On Campaign, Sakura of America, Egg Press, Hello!Lucky and I invite you to try some of these ideas. Grab a set of Pigma Professional Brush Pens, pick the lucky recipient and your favorite gorgeously letterpressed card, and send some beauty through the post. You might just get something beautiful in return. For this particular addressing task, I took on the challenge of using a utensil I don’t normally work with: a brush pen. For so long, this particular writing tool intimidated me. It felt elusive, uncontrollable, out of my comfort zone. And as creative people (yes, even you, you who doesn’t think they’re creative), pushing ourselves outside of our comfort zones periodically is uber important. Although I’m used to using all kinds of different writing instruments - fine-tipped, felt-tipped, chalk, gel, pencil, nib-and-ink - I still get to learn how to be a lettering artist every time I try something new. The first thing I did was experiment with how these particular brush pens release their ink. Pigma Professional Brush Pens come in three different sizes, which produces three different experiences of drawing with them. I tend to prefer thinner and more narrow lines, but for this challenge, I surprised myself by having a lot of fun with the thicker brush. The trick here is to approach a brush pen as if it’s a traditional nib and ink calligraphy pen. Keep the downstrokes thick, and the upstrokes thin. Practice putting more pressure whenever you’re drawing top to bottom, and easing up on the pressure when you start to lead the line in an upward motion. For me, this took a lot of practice. I’d go too heavy on the upstroke, or take the brush completely off the paper and lose my flow. I say experiment, practice, and have fun in the process. I know that I can tend to jump too quickly into trying to make everything perfect, but the real joy comes from learning more about yourself as an artist. When you start to get the hang of using the brush pens, even if it takes you much longer than you’d anticipated, then you’re ready to break out a stack of envelopes to write on. Just like the last post I did using Micron and Gelly Roll pens, the aim here is to allow the envelope to feel full, without feeling cramped or crowded. There’s a fine line between having too little and too much on the page, and especially since some of the real estate of your envelope is already accounted for by the stamp, this makes the composition even more important. Tip: If you’re working with white or cream unlined envelopes (meaning there’s no extra paper connected to the inside of the envelope, and you’re able to see through it), you can often create a handy straight-line guide. Cut a piece of thick white card stock slightly smaller than the size of the envelope, measure out how far apart you want your horizontal lines, and draw them in thick black ink. That way, you’ll be able to slide the guide inside each envelope, and ensure straight lines every time you write someone’s address. Once you’ve practiced and you have all your materials at the ready, have some fun with mixing up font and lettering styles, composition, a mix of whimsy with tradition, and outlining the envelope fronts with some graphic symbols and lines. These techniques work beautifully when writing to your Senators and Representatives, and voicing your concerns as an informed constituent. Imagine their delight when they see a beautifully addressed letter coming their way! I would love to hear your thoughts on using brush pens vs. other writing utensils. Are these new to you too, or are you an old pro? And which of these envelope styles are you excited to try? Leave a comment below! The Write_On Campaign is a labor of love. It couldn't happen without the abundance of skills, talents and passion of the many people who come together to create the annual Write_On Challenge. Each year, seeds of inspiration are planted, ideas percolate, cards and products are made. About ten months later, we debut not only Write_On Kits and Party Packs, but an entire program designed with one goal in mind: To encourage people to connect with one another in a meaningful way via the hand-written letter! This year, we documented our planning and production process so that we could share a few of the important steps with you. Read on and you'll meet members of our team, see what makes a letterpress card so unique, and find yourself more inspired than ever to complete the Challenge. And, no matter how many letters you end up writing this month, remember: Write_On is more than a 30 day challenge, it is a movement that creates a better world — one in which people engage in authentic communication with one another. Thank you for joining us! The Wall of Inspiration in the Egg Press Studio. Eunice and Sabrina of Hello!Lucky in their San Francisco studio. Letter-writing Kit design phase begins after our team has reviewed feedback from the prior year's Write_On participants. We ask ourselves, "What worked with the design? What didn't?" We ponder how to create cards that serve as tools for reaching out and connecting with one another. One card doesn't fit all, but our designs attempt to work for most. After a design review by the Write_On team, we finalize artwork and order the plates that will be used to print each card. The printing presses we use today were historically utilitarian workhorses, employed to create ephemera with individual pieces of wood or metal type set by hand. Today, we use polymer plates to bring our bold designs to life. The creation of plates involves a photo-sensitive process where the design is transformed from a computer file into a printable relief form. With our newly designed plate locked up and ready to go, we mount it to the press bed on one of our Heidelberg Windmill printing presses. Blank paper is stacked on a feed table where, sheet by sheet, it gets fed through the press in a windmill like fashion--thus the press' namesake. The polymer plate with Egg Press' Write_On card design affixed to a base and ready to be placed on the press. Our printers mix ink by hand to meet the specifications of our designs. Ink is applied to the press, and we're off! One by one, sheets of paper are moved into place and an impression is made. All of our Heidelberg Windmill printing presses date from the 1950's and 1960's. Cards are displayed on the presses so that printers can check each card coming off the press for accuracy of registration and color. Stacks and stacks of Write_On cards! All of our cards are printed on Mohawk Via Vellum Bright White paper. Once printed, crop marks delineate where paper will be scored and punched out, otherwise known as “die-cut”. Mohawk Paper provided all of the Via Vellum Bright White paper we used in the creation of the letter-writing kits, an entire pallet of beautiful paper! 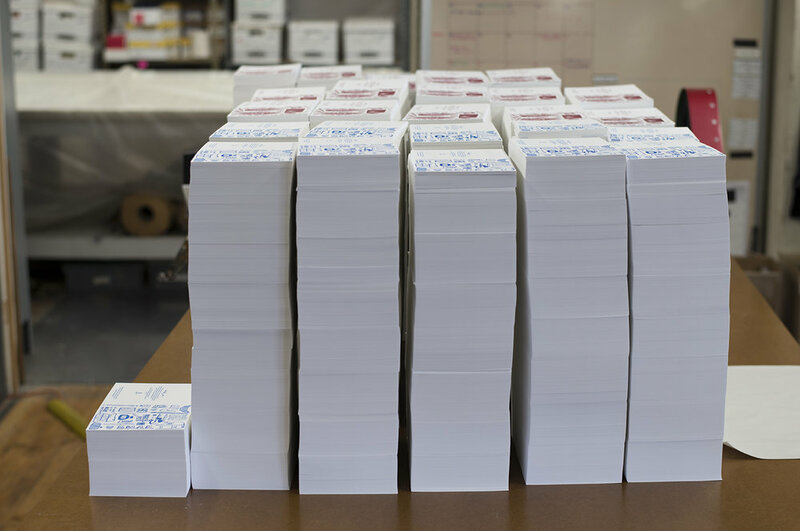 This photo gives a glimpse into what 50,000 Write_On cards looks like after having been printed, scored and die-cut. They are now ready to join forces with their matching envelopes, nifty insert, and a pen. They are getting closer and closer to becoming your kit! After thoughtful research into the best way to present the kit contents to you, our packaging team pulls all the pieces together. This year, we worked closely with Sakura of America to color coordinate the Gelly Roll pens they generously included in all of the kits going to those of you in North America. 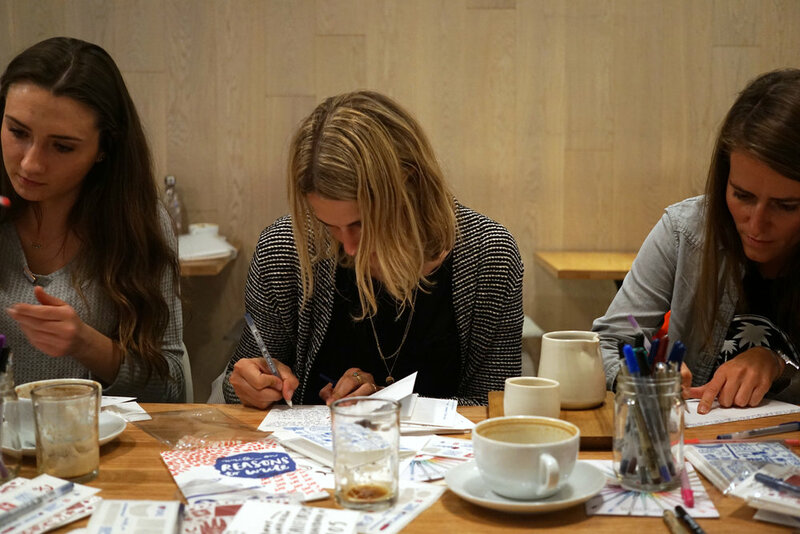 And, we worked with Mohawk Paper to craft custom envelopes to help you track your letter-writing progress, while showcasing your participation in the campaign with each card you send. The 2017 Write_On Kit debuts! Finally, we take pictures. Lots and lots of pictures, so that we can showcase the kits in a way that helps you know what you'll be receiving when you place your order. The only thing more exciting than seeing the kits complete and having engaging and innovative programming to deliver, is experiencing the passion with which you all embrace Write_On. We look forward to seeing your beautiful letters and to hearing about all of the connections you make this month. 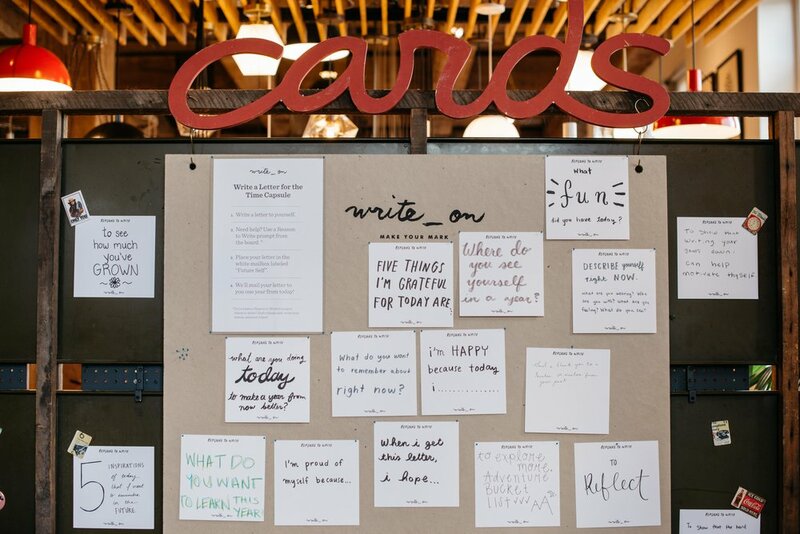 Write_On is bigger than a 30 day challenge or a kit of cards. It is a simple but powerful journey that we enjoy taking with you each year. Together, through letters, we can create a world rich in goodwill and meaningful relationships. Write_On! Christa Fowles, resident Write_On 2017 photographer, styles Write_On Kits and Party Packs in the beautiful Schoolhouse Electric Building, where the Egg Press studio and production facilities are located in Portland, Oregon. Miss Polly squirrelled away in her study. Polly Hatfield — known fondly in the letter-writing community as Miss Polly — considers herself paper besotted. Hands down, over the moon. In fact, she has often wondered whether there may likely be a paper wasp or two in her family line. She is most at home when squirrelled away in her study with vintage typewriters at hand and her ink pot full. We loved catching up with her in her study this spring. Read on and learn about some of Miss Polly's favorite letter-writing tools, and tried and true correspondence tips. Be prepared to be one hundred percent charmed by the magical, correspondence-rich world she has created in her home in SE Portland. I must confess, I have been a stationery magpie, office supply zealot and avid letter-writer since elementary school. I never fail to be utterly wowed by the magic those 26 letters of our alphabet have the potential to spur. And, in truth, sending mail proves the best bargain around. For a mere 49 cents for a first class letter, or only 34 cents for a postcard, you can quite literally send your words — whether a simple hello, a cherished quote, or an outpouring of love — on wing to anywhere in the United States. Hand to hand, door to door, heart to heart. 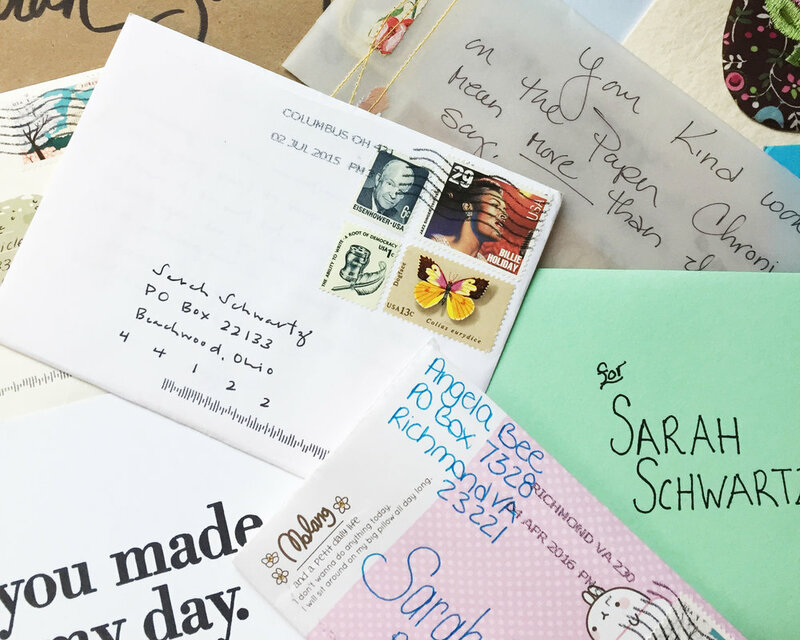 I wholeheartedly encourage you to join me and send well-tended epistolary joy as part of the Write_On Challenge this April: it's fun, easy and as the saying goes: good mail begets good mail. Make someone's day — and maybe your own, too. A wall of inspiration boasts treasures from near and far. I once had a yoga teacher that liked to remind her students to begin their practice prop rich. That way we'd be ready for whatever the practice called for on any given day. I've held on to that wise morsel and believe the same holds true for a letter-writing practice. A travel pouch brims with fodder for writing on the go. Rubber stamps are at the ready for envelope decorating. A warm cup of tea is reliably close at hand. By keeping an on-the-go portable letter-writing pouch on hand, you can jot a note when you find yourself with a clutch of minutes on the bus or when you've arrived early for your lunch date. A heartfelt postcard can easily be penned in these little wedges of time. 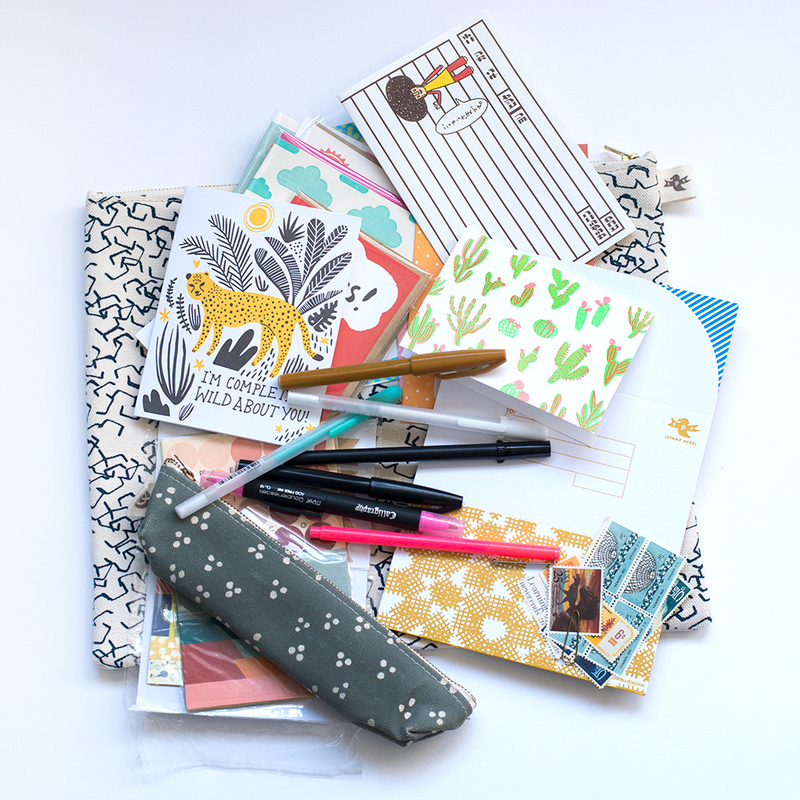 I like to keep my letter-writing pouch well stocked with a handful of postcards, a few well chosen cards and a tiny up-to-date address book. If you use an electronic device for your contacts, be sure to add postal addresses! 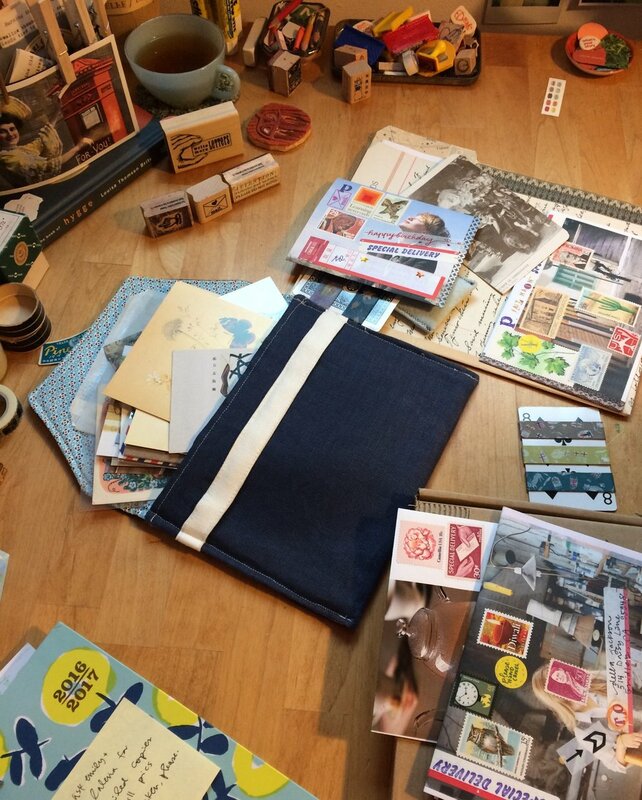 Keep a stash of postage stamps on hand, tucked into your wallet for spontaneous mail making. A few favorite writing implements add panache to your practice. I prefer vintage fountain pens, Prismacolor pencils and the vibrant strokes of Sakura Gelly Roll pens. To corral my lively assortment of writing implements, I employ a collection of castoff containers. Two vintage aluminum canisters that used to house someone’s kitchen staples: tea and grease! on a countertop near a long ago stove now call my desk-perch home, another sort of hearth, a fire that warms and feeds. Miss Polly takes an official Write_On envelope and adds color and visual texture with ink from rubber stamps and Sakura of America Gelly Roll pens. I relish making my own envelopes as well as decorating outgoing envelopes. A little postal joy for all the hands that touch each parcel along its journey. San Francisco-based Red Handed Rubber proves a reliable source of inspiration on the rubber stamp front, and their offerings never fail to make a great impression. The owner, Jennie Hinchcliff, is the co-author of the seminal & swoon-worthy book Good Mail Day: A Primer for Making Eye-Popping Postal Art. Miss Polly's basket of incoming mail invites time in the study to connect with loved ones. I keep recently received correspondence in one spot, a veritable trove to inspire, so I can both remember to reply in a timely fashion and also have them close at hand to answer any questions as I jot my reply. I choose to end my missives with a query or two so that they feel more like a dialogue than a simple reportage. A big basket that is often full to overflowing holds incoming postal gems which eventually migrate to the ‘replied to’ basket before being archived in old Korean teacake tins. Carving out time to write in our often busy lives can be challenging. Creating a warm and welcoming space to do so can help you make the time! Miss Polly readies her space by lighting a candle and arranging freshly plucked rosemary on her desk. Earlier Risers: A perfect way to start any day of the week: brew a pot of tea and collect some of your favorite letter-writing supplies. Light a candle or incense and spend the morning with pen and paper in hand — it's like sharing a cup of tea with an absent friend. Drop the missive in the mailbox on your way to work and know that you've launched your day off to a great start and will likely soon make someone else's day, too. Night Owls: If you find yourself more of a night owl than an early bird, practice letter-writing as a way to unwind at day's end. Settle into your coziest chair, or enjoy the especially indulgent practice of penning letters from bed. Like any practice, it's bit by bit. Congratulate yourself for each piece of mail sent and be sure to do whatever you can to kindle those letter-writing fires. The brighter they blaze the warmer they are. Remember: as mail artists like to say: you need to send good mail to get good mail. Valentine's Day is bigger than a box of chocolates and a dozen roses. And while we value romantic love — yes, our hearts swell at the thought of a chubby cupid running amok with an arrow aimed at a chosen few — we believe that everyone deserves to be celebrated on Valentine's Day. This year, we challenge you to put aside historical origins and preconceived notions about this holiday, and view it as an opportunity to reach out to friends, unlikely suspects, and anyone who has made a difference in your life, and let them know how much they matter to you. Family: If you've got the time and the interest, engage youngsters by crafting cards together and sending mail infused with affection to one another. Set up an inter-family mailbox in your home where cards can be placed and distributed to fellow family members. Friends: In addition to current friends, reach out to someone from your childhood with whom you've lost touch, or send a quick note to a new acquaintance whom you hope to know better. Thank friends for the time they devote to your friendship. Invite a future friend for a coffee date. Work: It's very possible that you spend more time with them than with your family: CO-WORKERS! Celebrate the unsung heroes of your everyday: current co-workers, former co-workers, people who work in the same building as you. Let them know that you appreciate their contributions to your day-to-day. School: Whether in grad school, preschool, or anywhere in-between, students surely benefit from words of encouragement, and the support lent by a simple expression of adoration. Many of us here at Write_On have a soft spot for Classroom Valentines, which have a knack for keeping it light, fun and pun-filled! Lover: Don't let a fear of blushing deter you! Honor the love of your life with a silly sentiment if the thought of poems and serious declarations of adoration are too intimidating. Let the puns and inside jokes run wild! The Write_On team isn’t waiting for April to roll around to lean into letter-writing. We’re resolving today to write more letters than ever in 2017. Curious how we’ll tackle the challenge in an increasingly digital, fast paced world? We interviewed a few of Write_On’s key players to uncover the secrets to a life-long practice of meaningful communication via the written word. * Who has been the most important person in your life? Can you tell me about him or her? * Who has been the biggest influence in your life? * What lessons did that person teach you? Who has been the kindest to you in your life? I also want to become a more informed and engaged citizen through Write_On this year. I’m pledging to write thank you notes to non-profit organizations -- for example, groups that are promoting civil discourse such as Bring it to the Table and The Village Square -- encouraging them to keep up the good work. And, I want to keep an eye on Congress and write letters to my representative to thank them for doing good work, or to let them know about an issue I care about, using this article in The Art of Manliness as my guide! I’m a letter writer, and love sending notes throughout the year. I drop a line when I see something that reminds me of a friend, and I try to be on top of birthdays, anniversaries and of course, thank yous. One of the things I most appreciate about the Write_On Challenge is its potency: an entire month dedicated to spreading the love, via letters. This year, in addition to sending general well-wishes to friends and those close to me, I pledge to focus my practice on writing to my more distant relatives on the regular. It may be lofty, but my aim will be to mail a letter a week to someone in my family who doesn’t hear from me much. My list will include cousins, aunts and uncles, as well as the “Aunties and Uncles” in my life; the friends of the family who have provided mentorship and inspiration to me over the years. Beyond reconnecting, my goal comes with another reward - the many surprises that come with the Write_On Challenge – the inevitable boomerang effect - the things that come back. I wonder: Who will write back? Who might I touch? And what might I learn? And all because I engaged in the simple but powerful act of writing letters. Now that Christmas is over you’re probably thinking about thank you notes you need to write for all the gifts you received. But what about saying thank you for someone’s time, energy or kindness? I’m super lucky to have so many wonderful people in my life that enjoy spending time with my son, take time to drop by and visit or just let us know when they are thinking of us. To kick start my letting writing habit for 2017 I’m going to let them know how appreciative I am for those experiences, which happen quite frequently and for which I feel very lucky! Who says all the color must be on the front of the card? I love making my writing colorful and fun! Working for Sakura sure has its perks – I’m able to combine and coordinate color and special effects across different products to create truly personalized notes and even match my note to the artwork on the front of the cards. My favorite thing to do is make key words pop off the page in either a more vibrant color or a glittering ink. I started lettering the names in Koi Coloring Brush Pen (seen here in Blue Green Light and Viridian), then wrote the note in Gelly Roll Moonlight in Green and went back over the words I wanted to emphasize with Gelly Roll Stardust in Lime Star. Tip: Choosing like colors from different Gelly Roll lines (all purples for example) makes it easy to use complimentary coordinating colors but with different effects. There are so many endless Sakura color combinations, nib widths and textures you can create, it makes note writing a very fun time for you and will make your note recipient feel super special too! It’s the infamous 3” 3-ring binder that I titled ‘The “Note” Book’ with a metallic gel pen that contains all of the notes we’ve exchanged throughout Middle School and High School. I stopped by my parents and found it tucked away in my old bedroom along with other items that reminded me of my childhood (a corsage from semi-formal, neon orange recorder from elementary school, and my CD collection containing early 2000 classics including 3LW). Earlier this year, you moved to Barcelona and it’s safe to say I may only see you three times a year. I haven’t thought about writing a letter to you in a while with today’s way of reaching out via social media, texting and video calling. But as I look at this binder and laugh about the truly random things we used to exchange (like the drawings of monkeys performing – odd things you would give me just because you knew I loved that animal), I couldn’t help but question why we stopped exchanging letters. We’ve had plenty of conversations in our young adult years that we’re not able to look back on because we either texted them to one another or talked over Skype about it. So with that, I’m taking the Write_On Challenge! More info here if you want to join: writeoncampaign.com. Expect a letter from me once or twice a month. The content? Who knows. The length? Who knows. Just know that I miss you and want to look back on our young adult life 20 years from now the same way I’m looking back at our childhood life now. Thank you for participating in the 2016 Write_On Challenge, our most successful challenge to date. 10,000 of you wrote nearly 300,000 letters in the month of April -- it turns out many of you have been missing letter writing in your life! If you struggled with writing 30 letters in April, take heart, you're not alone! The Write_On Challenge is a "challenge" for us at Egg Press and Hello!Lucky too. But we've yet to hear anyone say they regretted writing any letters and we've found that for some of us who've completed 3 years of the challenge now that the letter-writing muscles get stronger the more you use them. At Egg Press we have a dedicated letter-writing desk year-round that's always stocked with pens and cards and stamps and during Write_On (in the interest of friendly competition!) we keep a Write_On score card in the studio so everyone can mark their progress. Two of the biggest things we've learned are that having a dedicated place to write letters really helps and that by creating a regular habit, it becomes a regular habit, whether that's a weekly or monthly thing for you. We also get sooo much inspiration from hearing from you all and enjoy browsing the #write_on feed on Instagram (currently at 14,234 posts!). What an inspiring movement this has grown into! Actress Mary Louise Parker’s debut literary work traces the arc of her life through letters written to the men who have influenced it, both real--such as her father--and imagined. Beautifully written and lovingly crafted, the book reveals just how meandering, carefully observed, and creative a letter can be. You’ll find additional inspiration in her warm and engaging interview with Inflection Point Radio’s Lauren Schiller. In this true story, a middle class American girl becomes pen pals and, eventually, best friends with a boy from a Zimbabwe slum thanks to a class writing assignment. A dual memoir alternating between their perspectives, it shows how the simple act of writing a letter can lead to mutual understanding and transformation. TED speaker Hannah Brencher’s memoir describes how, fresh out of college and depressed, she began writing love letters to strangers and leaving them in bathroom stalls, doctor’s office, and all over New York City. 400 letters later, she had discovered a deeper sense of purpose and revealed how a letter can be the ultimate random act of kindness. Hannah’s campaign The World Needs More Love Letters, mobilizes people worldwide to write love letters to those in need. Though out of print, this charming children’s book tells the story of two friends -- a writer and an artist -- who seek to get away from the crowds and realize that they’ve each found true happiness when they’ve made enough creative space to send each other a Christmas card. A prescient and timely reminder for kids today on the value of unplugging and the true meaning of friendship.